Iselin, NJ – January 11, 2016 – eG Innovations today announced the next generation of its flagship eG Enterprise suite, a major release which directly targets the most important challenges of performance management for the modern Citrix-driven enterprise – in any industry. This new release builds upon eG Enterprise’s end-to-end, virtualization-optimized IT performance monitoring capabilities, addressing Citrix’s evolving technology requirements, including built-in best practices for monitoring Citrix XenApp and XenDesktop 7.x. eG Enterprise 6.1 also adds timesaving features to help administrators identify performance issues sooner, analyze data more effectively, and provide more overall value to the business. eG Enterprise is an integrated suite of dashboards, infrastructure topology-views, drill-downs, reports and automatic alerts that, together, offer the industry’s most advanced end-to-end IT performance monitoring and diagnosis solution. 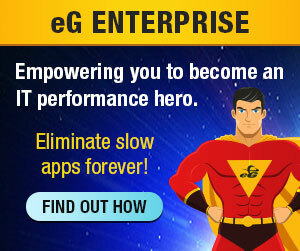 eG Enterprise also offers Citrix-driven IT organizations the benefit of the industry’s only 3-dimensional performance monitoring coverage: Reach across every – tier, network, storage, virtualization, Citrix, applications and more; Depth of coverage – putting the metrics that matter at your fingertips; and, Speed to resolution – helping administrators to detect and fix issues in minutes, instead of hours. To learn more about eG Enterprise 6.1 visit eG Innovations’ website, or on-site at Citrix Summit 2016, visit Booth #507.